Giving game-playing instructions to the Biology Department with my megaphone and my helpful assistant, Mike Fath. IMAGES COURTESY RACHAEL BONOAN. Professor Mitch McVey and PhD Candidate Marcus Lehr working together to finish the relay race. IMAGES COURTESY RACHAEL BONOAN. 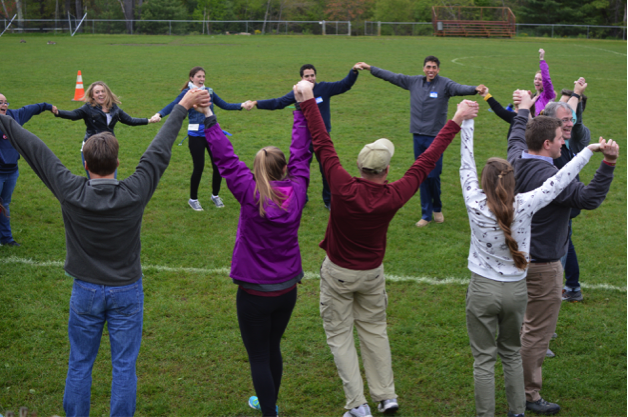 During the second half of the retreat, students, faculty, and staff participated in team-building games organized by yours truly. 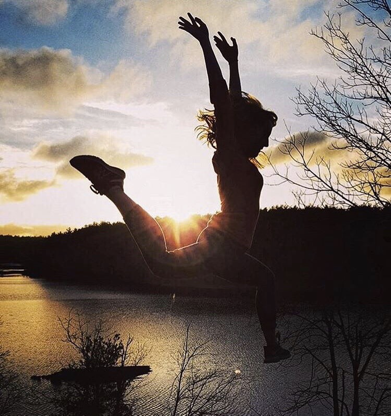 I was a camp counselor for a few years during my undergraduate career, so organizing outdoor games and activities was really a treat for me. 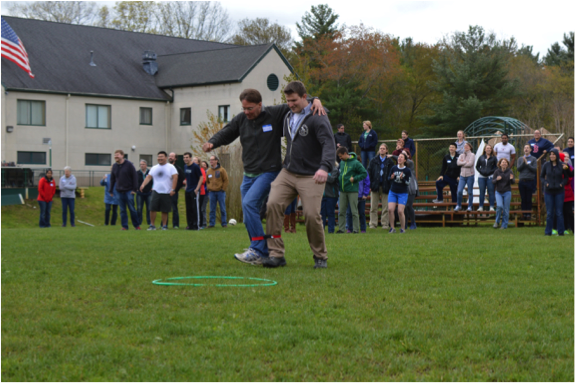 I planned a hula hoop passing game, a relay race, and a human knot activity for retreat participants. 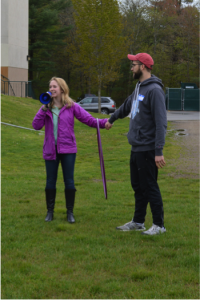 I got to use a megaphone when directing the activities, and I got to watch the influence of my camp counselor enthusiasm on adults. One team working together to untangle their “knot”. IMAGES COURTESY OF RACHAEL BONOAN. My favorite part of the retreat was directing and watching the human knot activity. I separated the department into four equal teams and instructed everyone in each team to cross their left hand over their right hand in a tight circle facing inwards. I then told everyone to grab the hands of two different people in their group, and work together, once connected, to untangle the “knot”. The human knot activity requires every individual to actively work with others to uncross not only their own hands but also the hands of their teammates. Additionally, the human knot activity tends to be successful only when teammates communicate their thoughts and ideas with others in their group. For example, if one individual tries to untangle the knot by themselves, they could end up dragging their teammates along and pulling people to the ground instead of helping others up or helping the team get out of the knot. 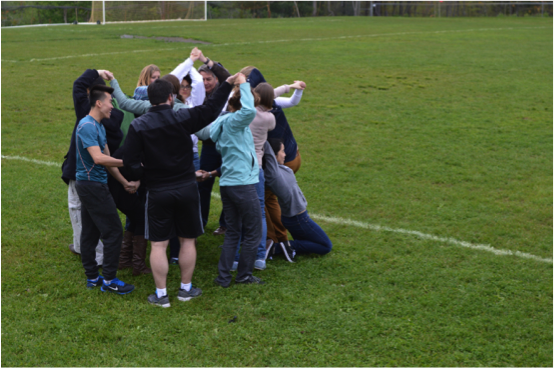 Many scientists pride themselves on being independent thinkers and workers, so the human knot activity proved especially hard for some teams. I coached struggling teams on openly discussing their ideas with their teammates and pushed for some of the more reluctant team members to participate in the open discussion. In the end, all teams successfully untangled their “knots”! The memories made at the retreat and the experiences shared between students, faculty, and staff created a noticeably more inclusive and welcoming environment within the Biology department. I look forward to attending the next Biology department retreat and welcoming the newest cohort of graduate students into our Tufts Biology family! The first team to successfully untangle their human knot. IMAGES COURTESY OF RACHAEL BONOAN. This entry was posted in Clubs and Community, Student Life on February 5, 2018 by gmanti01.